A caesarean section, or C-section, is surgery to deliver your baby through a cut, called an incision, that the doctor makes in your lower belly and uterus. You may have some pain in your lower belly and need pain medicine for 1 to 2 weeks. You can expect some vaginal bleeding for several weeks. You will probably need about 6 weeks to fully recover. It is important to take it easy while the incision is healing. Avoid heavy lifting, strenuous activities, or exercises that strain the belly muscles while you are recovering. Ask a family member or friend for help with housework, cooking, and shopping. If you are breastfeeding, limit alcohol. Alcohol can cause a lack of energy and other health problems for the baby when a breastfeeding woman drinks heavily. It can also get in the way of a mom's ability to feed her baby or to care for the child in other ways. There isn't a lot of research about exactly how much alcohol can harm a baby. Having no alcohol is the safest choice for your baby. If you choose to have a drink now and then, have only one drink, and limit the number of occasions that you have a drink. Wait to breastfeed at least 2 hours after you have a drink to reduce the amount of alcohol the baby may get in the milk. If you breastfeed your baby, you may be more comfortable while you are healing if you place the baby so that he or she is not resting on your belly. Try tucking your baby under your arm, with his or her body along the side you will be feeding on. Support your baby's upper body with your arm. With that hand you can control your baby's head to bring his or her mouth to your breast. This is sometimes called the football hold. You have severe vaginal bleeding. This means that you are passing blood soaking through a pad every hour for 2 or more hours. You have new or worse pain in your belly or pelvis. 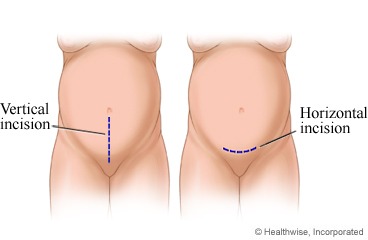 Enter M806 in the search box to learn more about "Caesarean Section: What to Expect at Home".